Hello lovelies! Today I'm starting my "Shop Small Series." I love the idea of supporting shops featuring items created by friends or locals in the community. While there is definitely a place for mass retailers, I love the care and attention given to products sold by small shops. The shop I will be featuring today is Lilly Noelle jewelry. I've known about Lilly Noelle for years now. My aunt is a friend of the owner, Heidi, and she used to gift me pieces for my birthday. Since then, I've always loved browsing Heidi's fun website. One of my favorite things Lilly Noelle does is the earring of the month club. This is basically a gorgeous earring subscription, and it makes a great gift for anyone! I've gifted it to both my mom and my mother-in-law, and they loved it! Each month you will get a pair of earrings. It's like the gift that keeps on giving! For my birthday this past year, my Mom gave me one of Lilly Noelle's leather cuffs for my birthday, and I've worn it SO many times since I've gotten it. All of Heidi's items are such high quality, and you definitely are getting your money's worth. 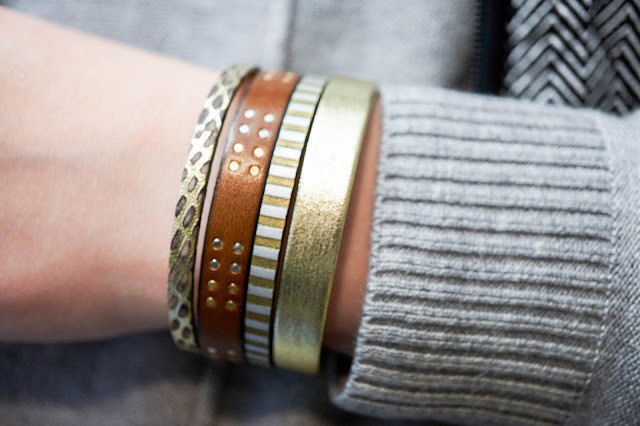 This genuine leather cuff has just the right amount of modern with the mixed prints and textures. I also have found that it is so versatile and can really add a unique touch to an outfit. Overall, I highly recommend Lilly Noelle, and I hope you check out her shop for great gift ideas or just a little bling for yourself!